Whatever the weather, one benefit of an automatic garage is that it helps to keep both you and your car warm and dry, when you arrive or leave home. It makes sense to ensure that your garage door is suitably weather-proofed before weather conditions take a turn for the worse. By keeping your garage warm and dry, you can prevent warmth from escaping and cold air from entering your home through your garage space. As the cold weather approaches, check your garage door for gaps. It’s really easy to carry out a visual inspection, all you have to do is securely close the door and with a flashlight, carefully look around the edges for pesky gaps. Once you have identified any spaces, you may even be able to seal them yourself using gap filler. 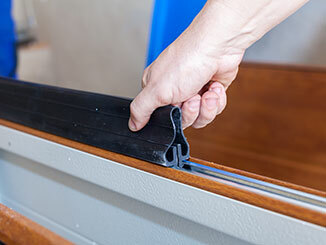 Running along the entire length of your garage door you should find a long rubber strip. This strip is a much-needed draft proof barrier, designed to prevent cold air from entering your garage from below. In order to stop cold air from coming in, it is important that your door not only closes properly, but also that this strip is kept in tip-top condition. Should you feel any cold air, raise the door and take a good look at the weather strip. If it looks old or worn, it's a good idea to arrange for a replacement sooner rather than later. Most of the checks we have looked at in this blog are easy to do and will only take a few minutes. They will, however, help you to make sure your garage is warm and dry through the colder and rainier months. Think how important this is, especially if your garage is attached to your home. Our experts at Garage Door Repair Midlothian are here to help you ensure your door is properly insulated, draft free and warm. Take action now and keep your household cozy for the months to come!